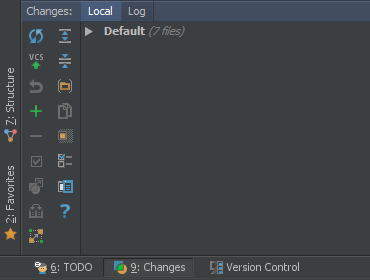 I'm working on PhpStorm 6.0 build #PS-127.100 with an evaluation license, and I'm trying to figure out how to unshelve changes. - I ended up after many hours of coding with an ugly design for my project, but I wanted to keep some of the functionnalities I had added. So I looked toward keeping those in a kind of temporary storage, and found the shelving/unshelving process. - I'm stuck trying to get some pieces of my code back ! Here's how it looks, where the 'Shelf' tab should be. Sorry for not seeing those earlier, anyway I'm still searching for a clear answer.